I and my husband a long time fans of Ling Ling Asian Kitchen. We work for tech companies, have a toddler, and we also have tons of hobbies. So, we do not have much time for cooking. This makes it important to have easy, fast, but still healthy meals. Ling Ling Asian Kitchen is on the list of our favorite frozen meals that we always keep in the freezer. Ling Ling’s instructions are so easy, that even my husband (who can barely boil an egg) can prepare dinner. It is also easy to pick up from the stores since you can buy Ling Ling Asian Kitchen pretty much everywhere: Walmart, Target, Costco, Safeway, Lucky’s etc. If somehow you do not have any of those major chains nearby, try checking out this link to see where you can buy Ling Ling Asian Kitchen in your city. Neither my husband or I grew up in a household that cooked Chinese food. But, we are both huge fans. Fortunately, Ling Ling Asian Kitchen’s quality is such that no one you serve it to will know that it is not homemade. We have even served it on Chinese New Year. This February we plan to do that and this time we have a secret weapon. In honor of Chinese New Year Ling Ling Asian Foods and Chef Katie Chin hosted a cooking party that I was able to attend. At the party, I was given a number of tips to take the already fast and delicious dinners with Ling Ling and make them something truly special. 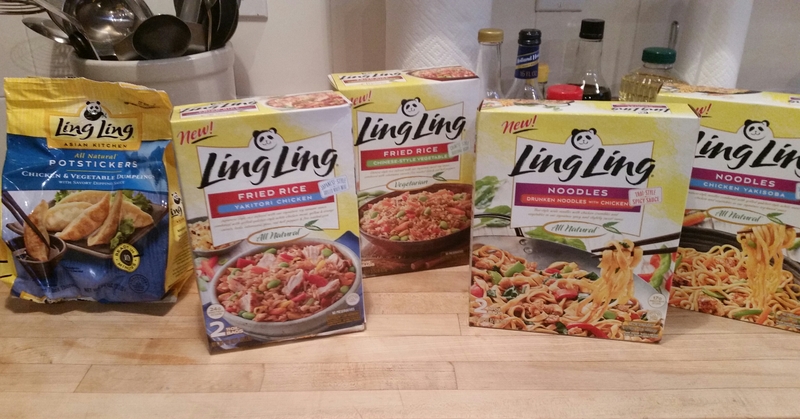 Before I get to that, though, I’m going to give you a quick rundown on some of our favorite Ling Ling Kitchen products that you should try. As I mentioned before, they are sold pretty much everywhere, but you can check the list of the stores where to buy here. Ling Ling Asian Kitchen Drunken Noodles and Yakisoba Noodles. They are sauce-infused authentic Asian-style noodles paired with succulent chicken and delicious vegetables. My husband normally prefers rice dishes, but my son is so cute when he is eating noodles, that we both agree the noodles are #1. Ling Ling Pot-stickers. The pot-stickers come in three varieties, chicken, pork, or veggie. The chicken and pork also include veggies and each one comes packaged with Ling Ling’s signature dipping sauce. My husband and I love pot-stickers. But, we haven’t managed to get our son to take them seriously yet. He mostly nibbles on the noodle. Ling Ling Yakitori Chicken Rice. We like all of the rice dishes, but the yakitori chicken is our favorite. It is a home-style rice with a delicious chicken grilled yakitori style, long grain rice, carrots, leeks, peas, red bell peppers, and corn. My husband prefers Ling Ling’s to the chicken-fried-rice served by our favorite Chinese restaurant. Chinese Style Vegetable rice. This authentic Chinese rice is packed with veggies and very filling. My son is a real carnivore. So, he digs around the veggies looking for the chicken. But, this rice is prepared vegetarian. So, he’s not going to find any meat. Now, for the tips I promised to make your Chinese New Year meal memorable. 2. Prepare Cucumber Edamame Salad with Ginger Soy Vinaigrette, this is the recipe I got from chef Katie Chin on Ling Ling Asian Kitchen party. She is an expert of Asian cuisine, so believe me this salad is worth it. It is super light and excellent for both vegetarian and non-vegetarian party. You would need to have a spiralizer to prepare this salad. Make the dressing: In a small bowl, combine the dressing ingredients. Gradually whisk in the sesame oil and canola oil until well blended. Set aside. Spiralize or very thinly slice the cucumbers, soaking up an excess liquid with a paper towel. Toss together the cucumbers, edamame, red bell pepper and jalapeno. Drizzle the dressing on top and toss again to blend. Garnish with black sesame seeds serve. Soak the skewers in water for 20 minutes. Make the marinade: In a small bowl, whisk the marinade ingredients together. Gradually whisk in the sesame oil. Set aside. Alternatively thread the tomatoes, mushrooms, squash, zucchini, onion and bell peppers onto the skewers. Pre-heat a grill or grill pan to medium heat and brush with oil. Brush the marinade over the vegetables. Cook skewers on the grill or grill pan until vegetables are tender, turning and basting vegetables with sauce mixture occasionally, 10 to 15 minutes. Wishing you All the Best and Enjoy Ling Ling Asian Kitchen!